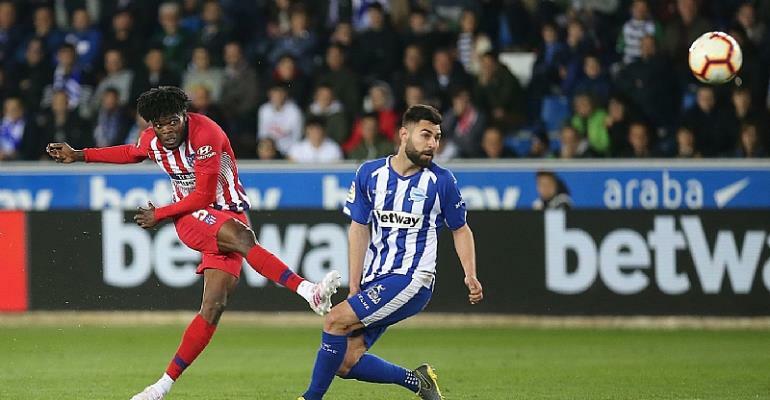 Thomas Partey scored an incredible goal as Atletico Madrid whipped Mubarak Wakaso's Deportivo Alaves 4:0 in the Spanish La Liga on Saturday evening at the Estadio de Mendizorroza. Goals from Saul Niguez and Diego Costa ended the first half in a 2-0 win in favor of the visitors. Spaniard Alvaro Morata extended the lead to 3-0 with his strike on the 59th minute of the game. The Ghanaian midfielder sealed their home victory with an audacious strike on the 84th minute of the game. He enjoyed the full duration of the match whiles his compatriots Mubarak Wakaso and Patrick Twumasi came on in the second half. Partey has scored three goals in his 34 appearances for Atletico Madrid in the ongoing season.